Sorry I’ve been a bit MIA….life sometimes gets in the way of blogging and life has been crazy over here! But I had some time the last few days to schedule some more yummy recipes! I don’t eat (or cook) much red meat, as you may have noticed with my lack of red meat cooking. It’s really for no other reason than I don’t like the meaty taste in steaks, burgers, ground beef. BUT if I find a good recipe that is very flavorful and can camouflage that taste I don’t like……it’s a keeper! And this is one of those recipes! I got it from a friend of mine a few years ago. This marinade is sweet and savory…..it also really keeps the meat tender. YUM! 3+ Tbs. peach preserves (can use apricot if can’t find peach) – may need more to taste. Combine all ingredients in large zip lock bag with meat and stick it in the fridge no less than 3 hours, but as long as over night! The longer it sits, the better it tastes. I usually keep mine in over night, and during the time it’s in the fridge I squish it around in the bag to make sure all the meat gets nice and marinated! Heat grill to medium-high. 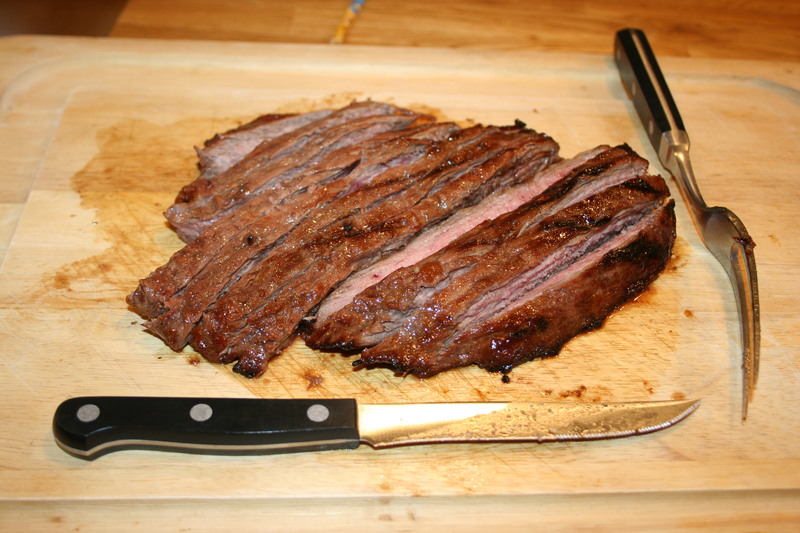 Place steak on grill and cook for about 5 minutes in each side….I wouldn’t go less than 4 or more than 7 on each side. Remove from grill and place on cutting board. Let it sit for a few minute, slice and serve!